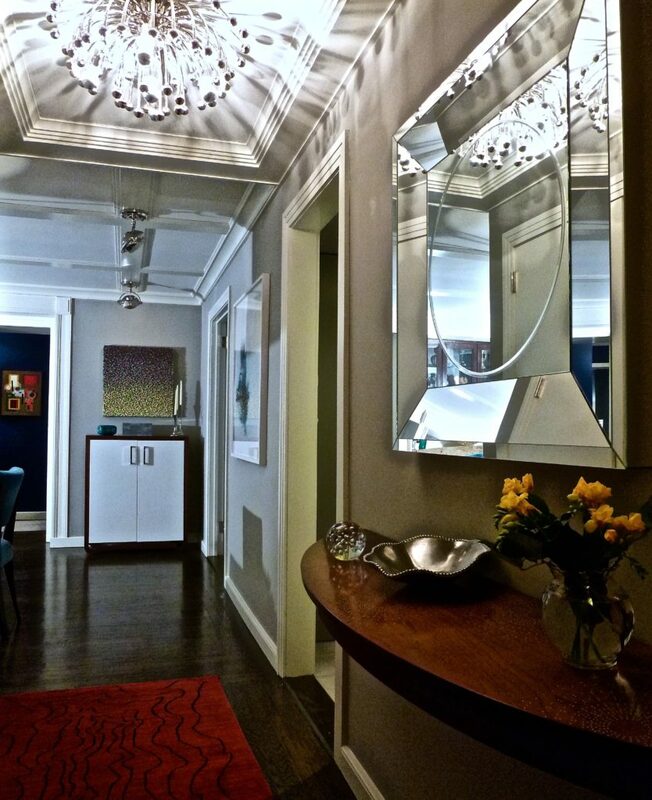 Contemporary stepped mouldings add modernity to classic architectural detailing throughout this apartment renovation and a lively modern light fixture creates shadows on the ceiling of the Entry. 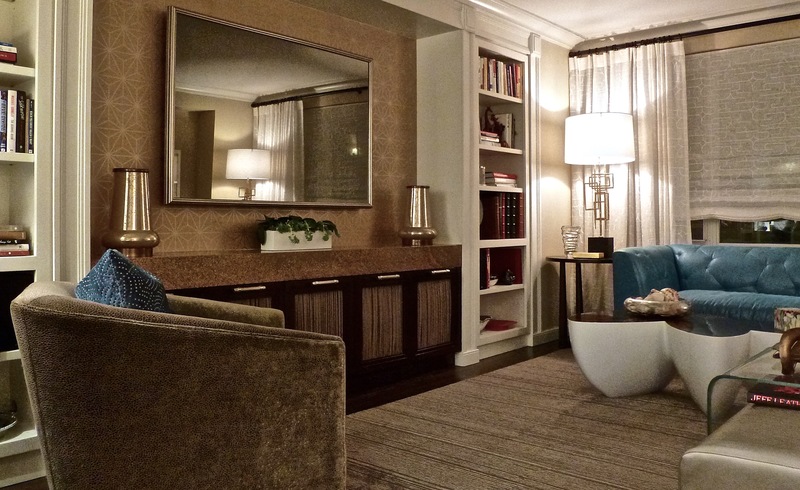 A custom wall mounted curved table & dimensional mirror give this small narrow Entry a sense of place beyond it’s scale. 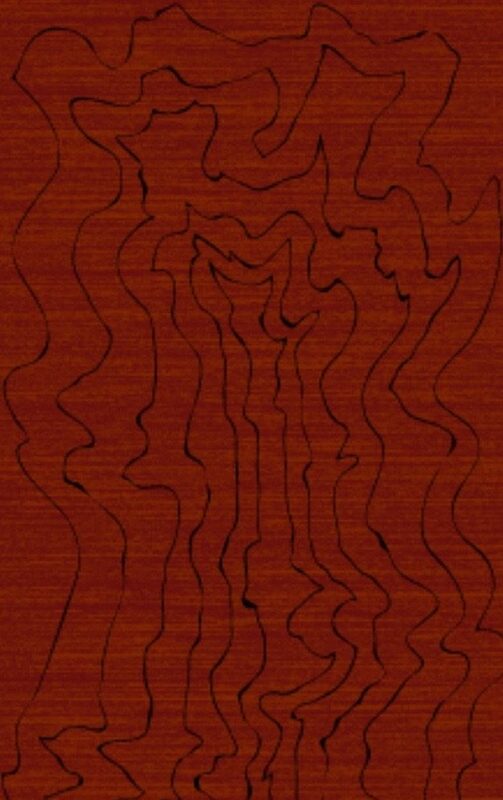 A detail of the lively custom designed handmade wool carpet in the Entry is shown above. 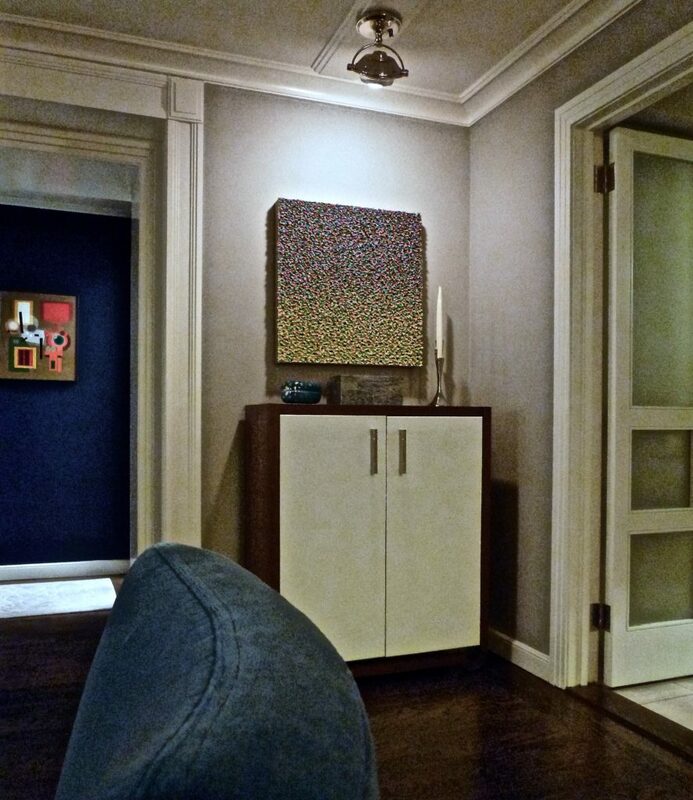 A oil painting with heavy impasto by Robert Sagerman hangs above a custom cabinet with white leather doors. 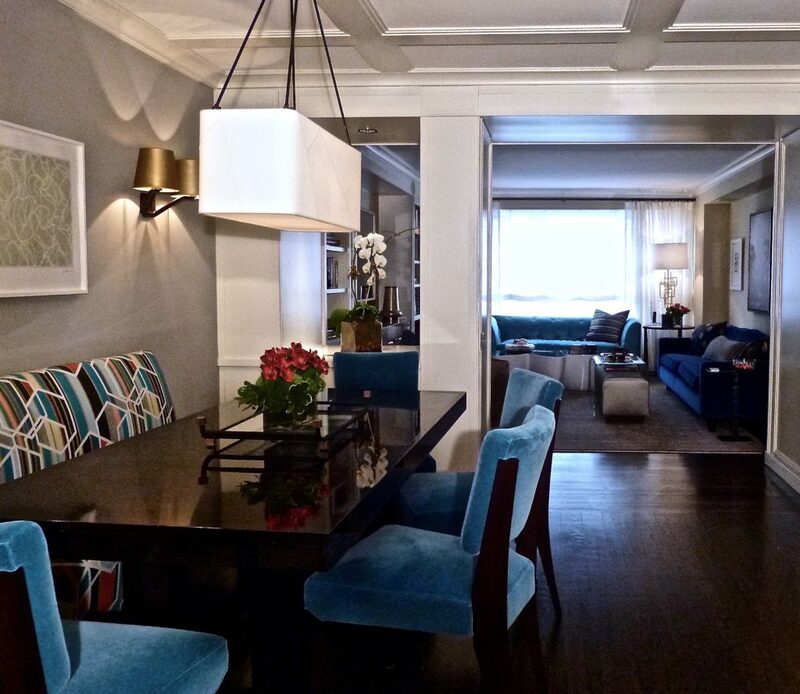 A ceiling moulding pattern allowed the installation of multiple ceiling lighting fixtures in the Dining Room. 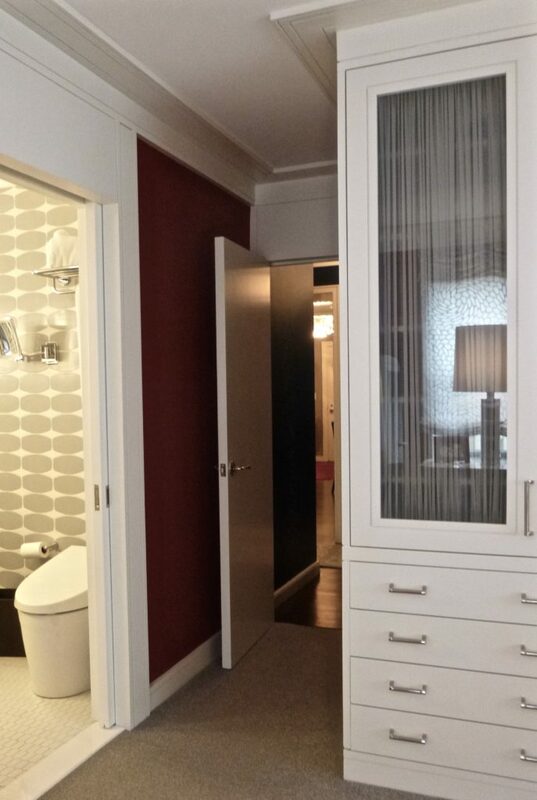 Built in cabinetry visually separates the Dining Room and Living Room while providing storage space for both areas. 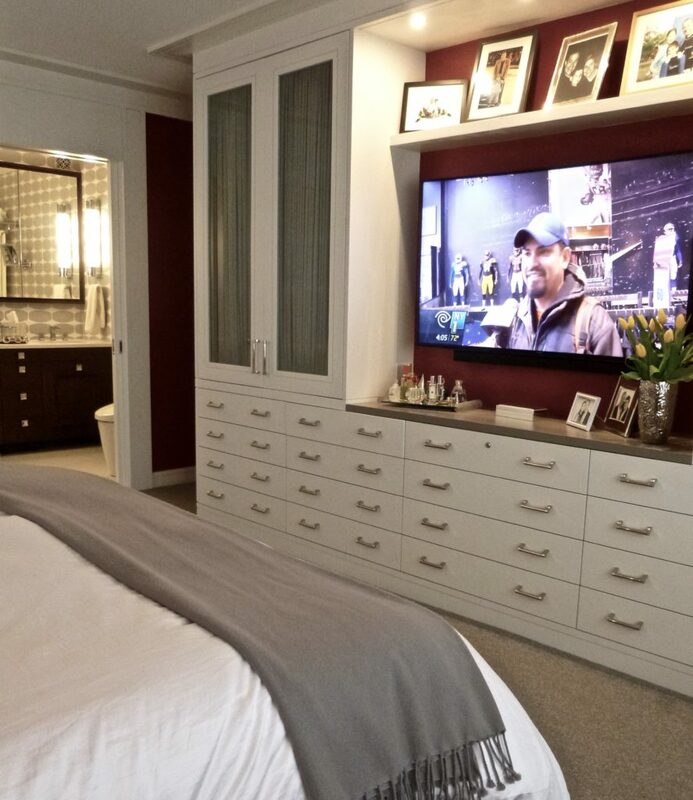 Built in bookcases frame a TV hidden behind the framed mirror while curtains in the cabinets below hide the speakers and sound system. 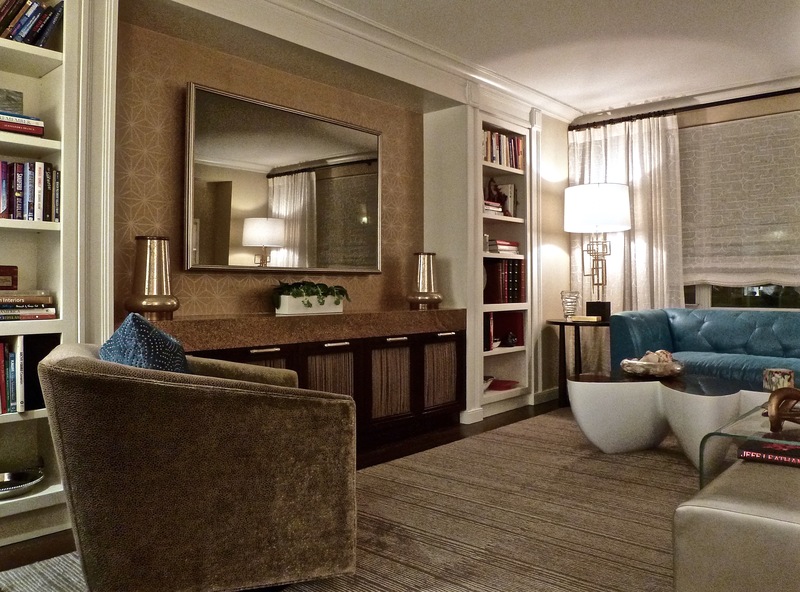 The wall between is papered in a custom wallcovering. A pair of antiqued mercury torcheres sit on either side of the mirror. 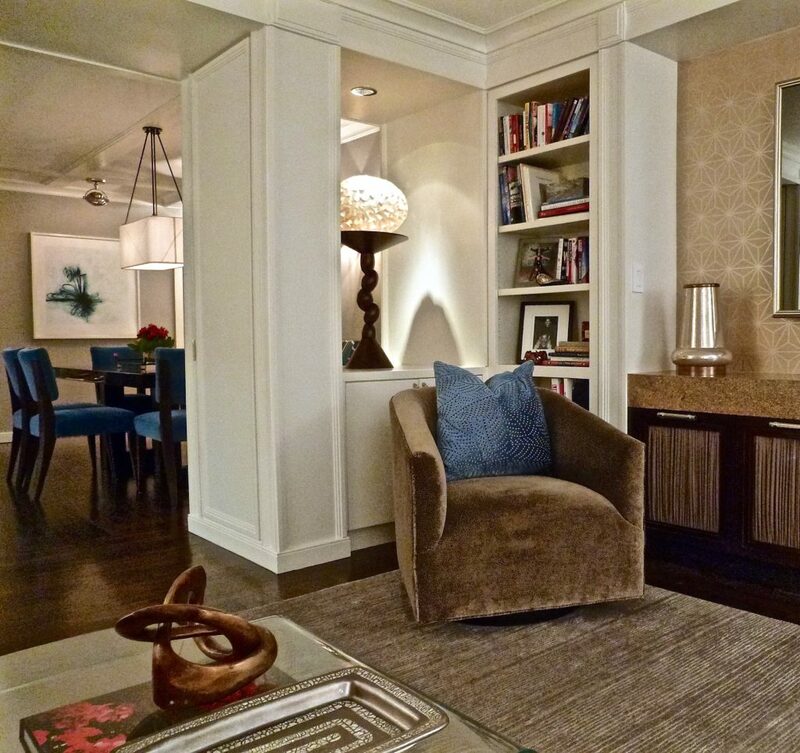 A swivel tub chair hugs the cabinets separating the Livingroom and Dining Room. 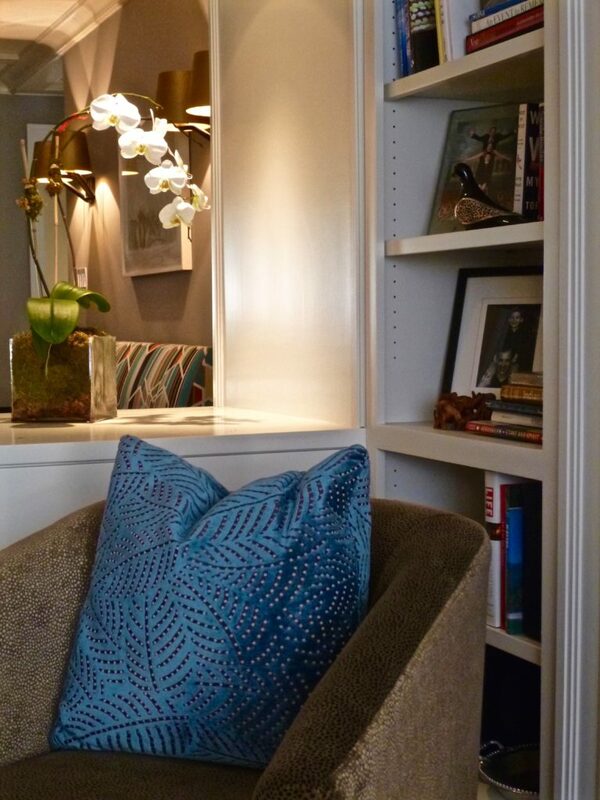 A contrasting patterned velvet pillow back on the chair continues the medley of blues. 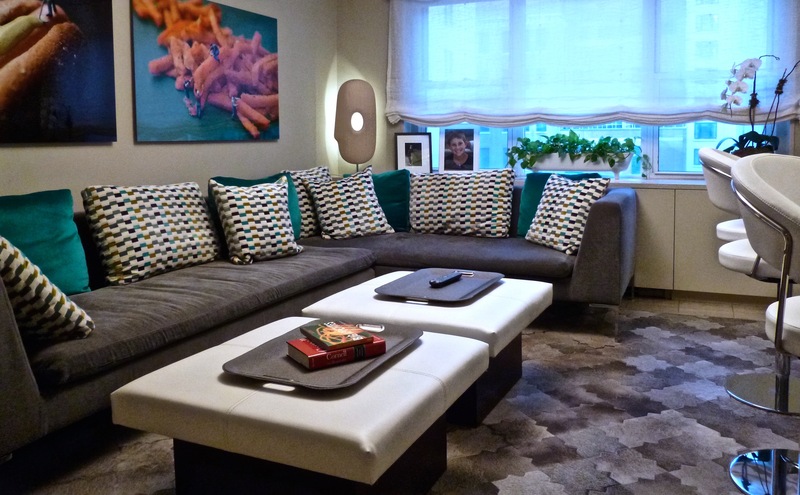 Colorful upholstery fabrics and patterned pillows brighten the Livingroom. A print by Cy Twombly, an oil painting by Tom Leaver and a print by Richard Artswager hang on the long wall above the 10 ft sofa. 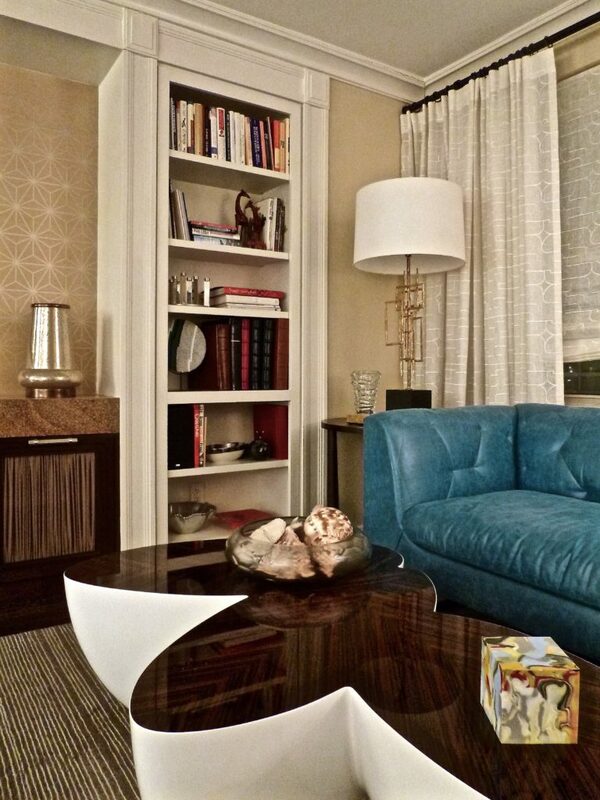 A bent glass table sits over a bronze metallic finish leather ottoman. 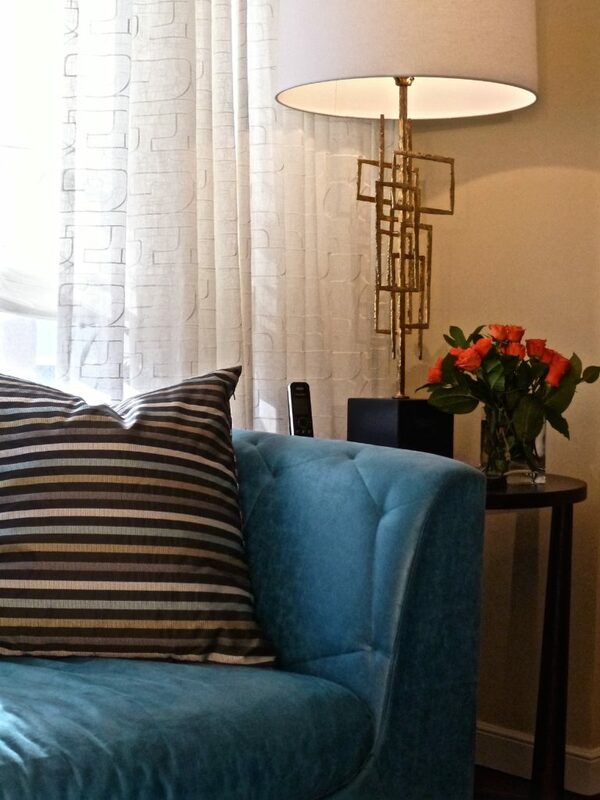 Vintage lamps silhouette against the embroidered sheer linen window treatment and a colorful glazed linen sofa with abstract geometric tufting sits in front of the window wall. A playfully shaped coffee table with white lacquered curvilinear forms and a book matched zebra wood top enlivens the end of the Livingroom. 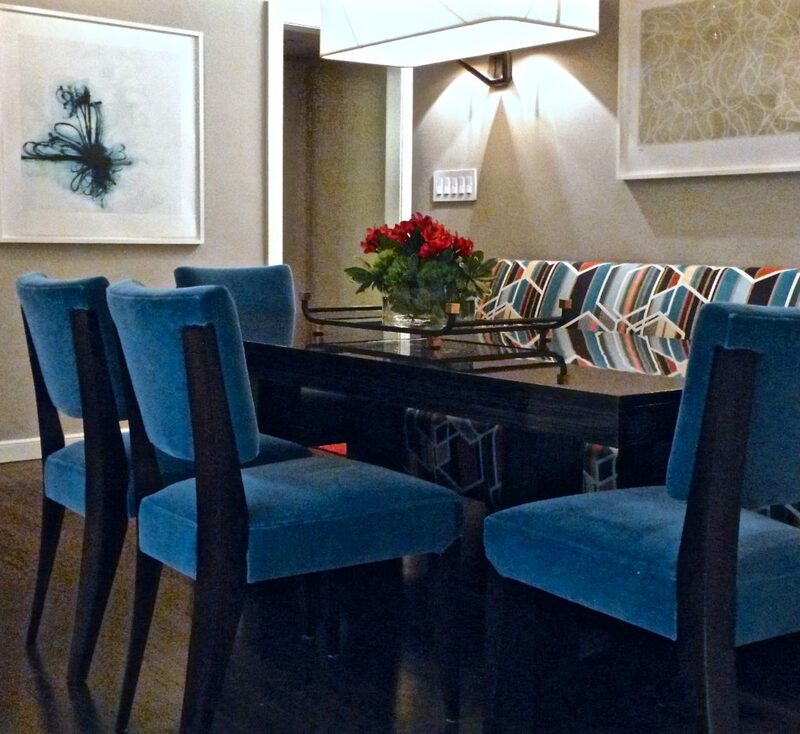 The multicolor Maharam fabric on the custom dining banquet and the rich blue mohair on the dining chairs add life to this modern dining area. 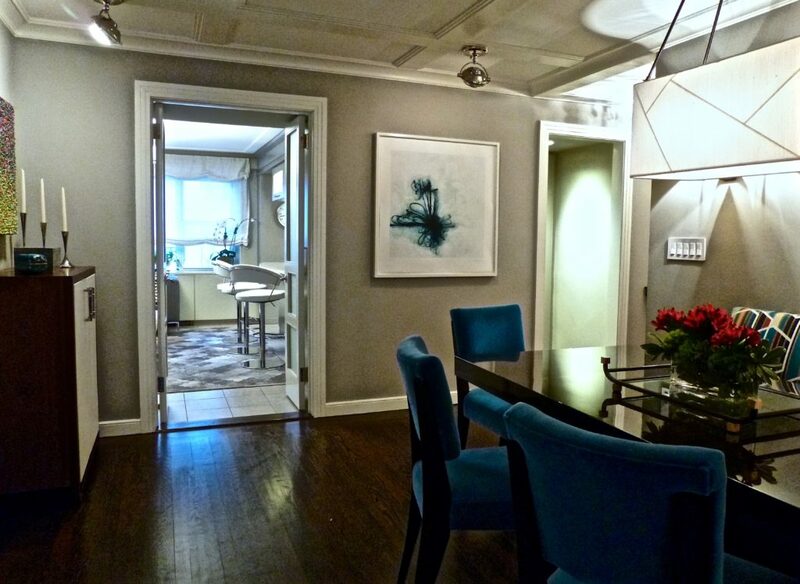 A print by Cy Twombly sits above the dining banquet and one by Jill Moser hangs on the far wall. The seating area off the kitchen is a perfect place to gather around the TV and the kitchen activity. A multi toned hide carpet covers the floor. 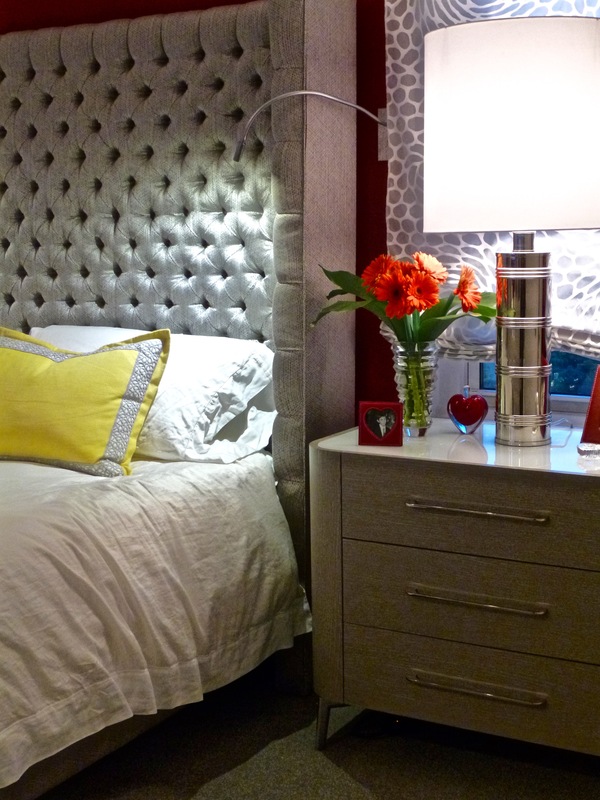 The faux leather ottomans make casual meals over ball games possible. 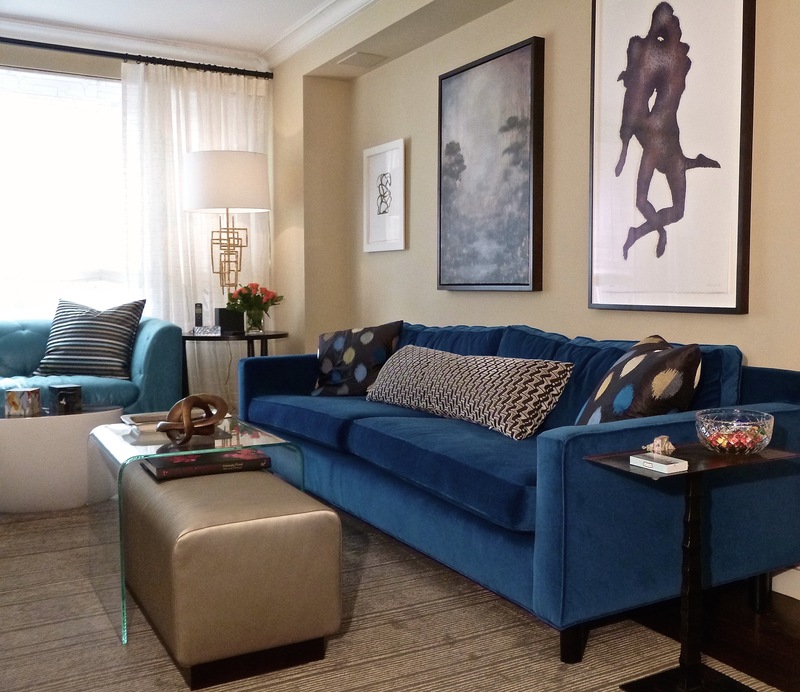 Photographic prints hang above the sofa. 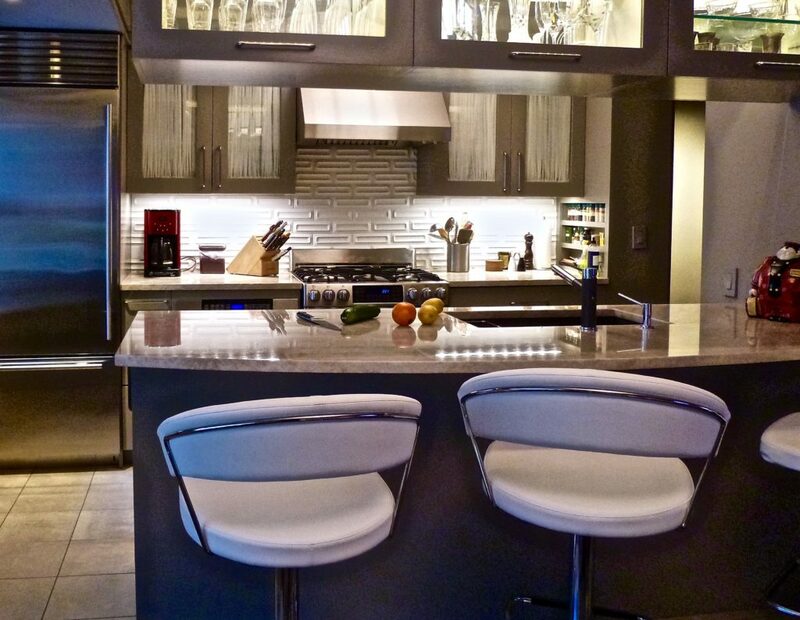 Bar stools facing the kitchen work areas make this heavily used kitchen great for gourmet cooking with family & friends and the Taj Mahal Quartzite counters make beauty practical. 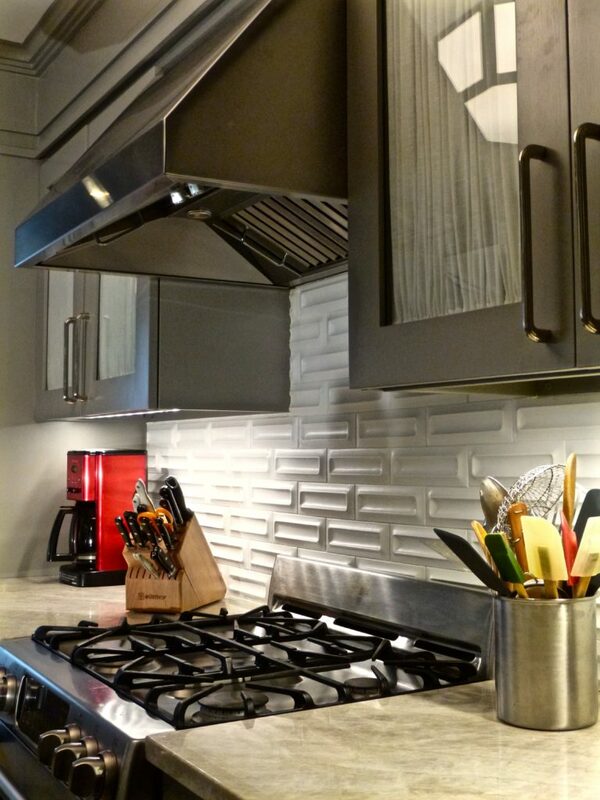 Sculptured backsplash tile and cabinet door curtains add beauty to the open work areas. 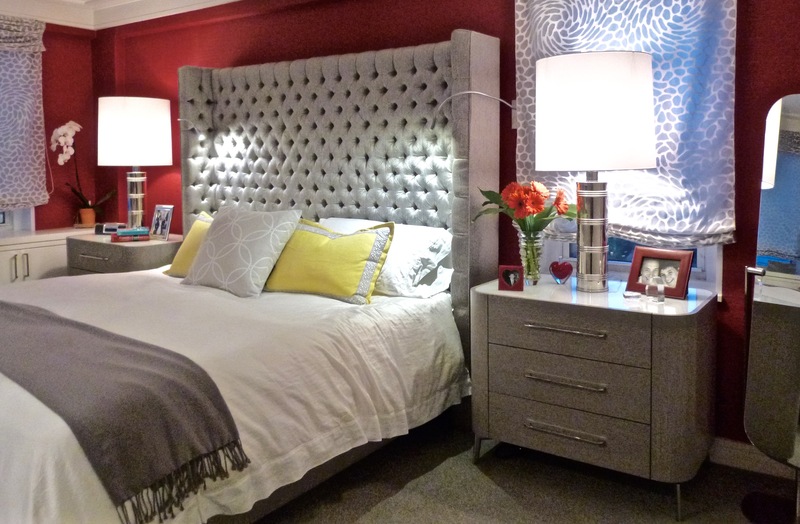 In the Master Bedroom the tufted headboard on the upholstered bed provides a little romance. Sheer patterned Roman shades provide privacy and give softened window light in the day while motorized blackout shades behind provide darkness at night. 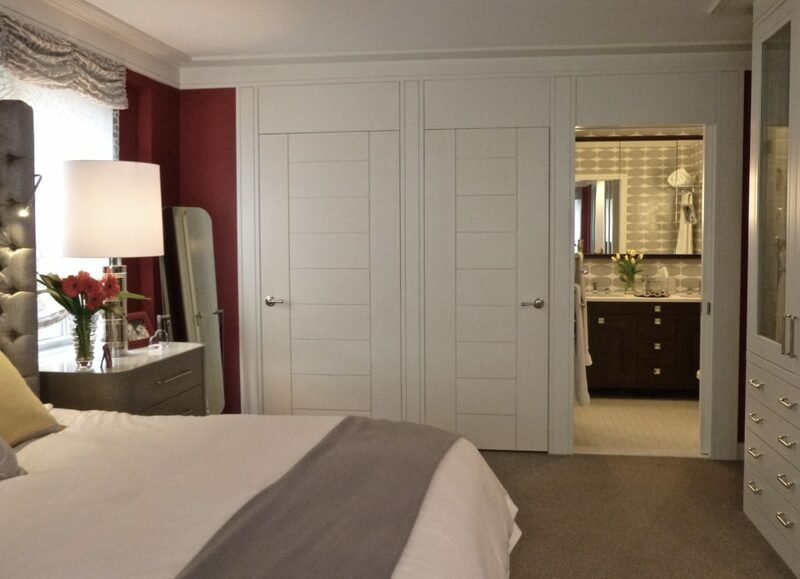 Custom modern doors and flat grooved ceiling mouldings add definition while remaining sleekly contemporary. 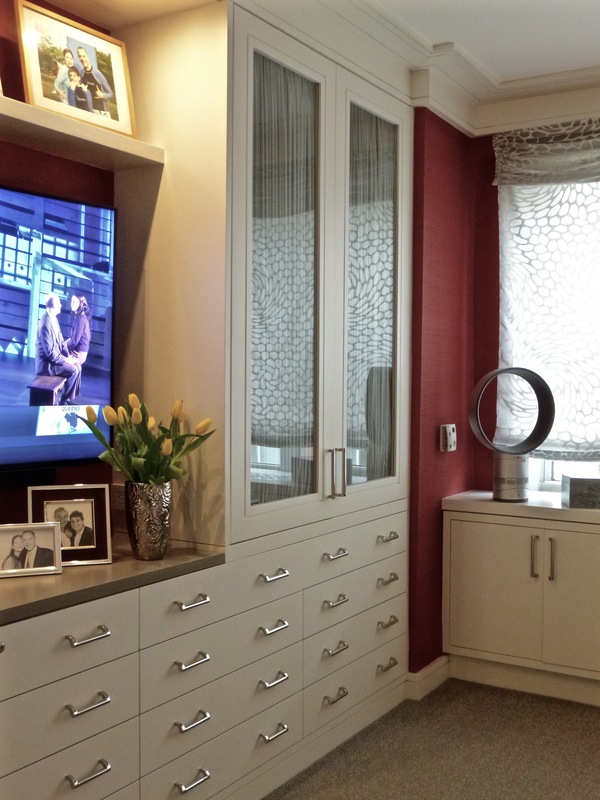 Sheer curtains in the glass doors of the cabinets soften the cabinetry wall and providing interest while hiding storage space. 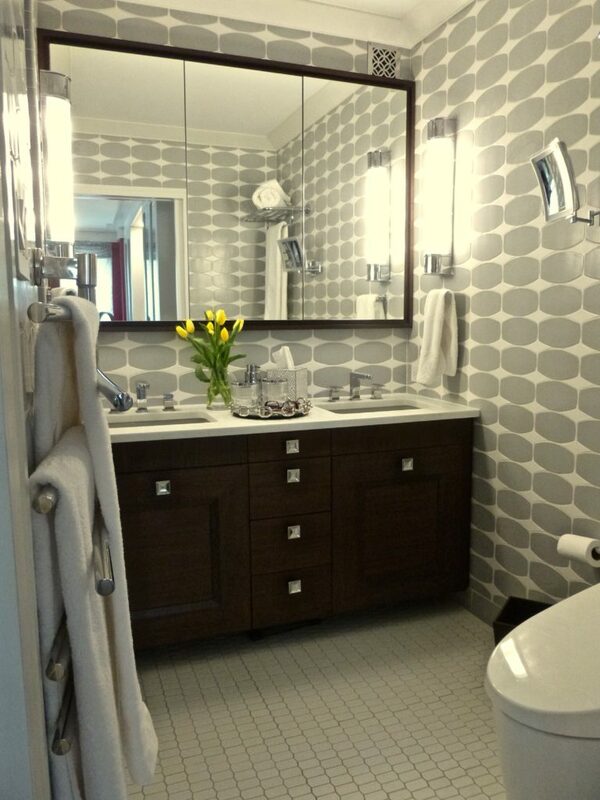 In the master bath a handmade grey & white tile pattern on the walls sets a tone of detailed craftsmanship. Coordinated stacked tiles and marble slab shower seat continue the fine detailing. 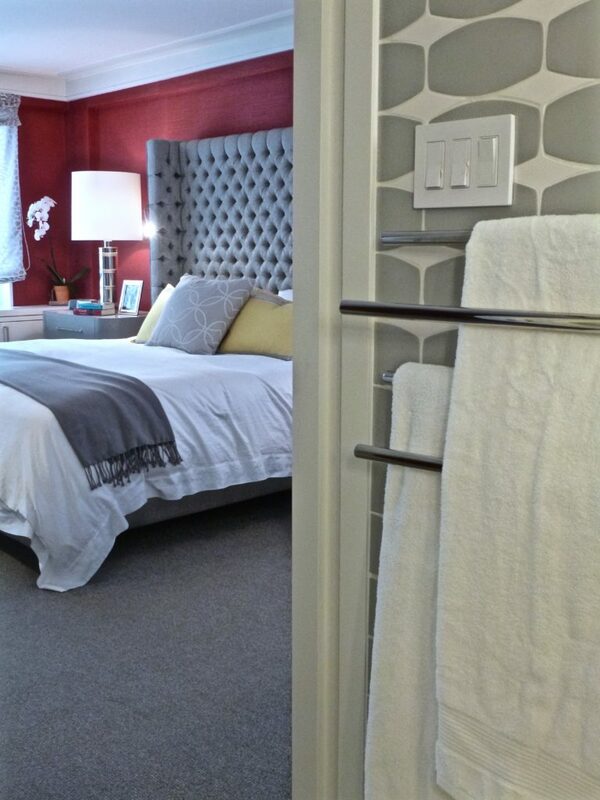 A swinging towel warmer allows that extra touch of luxury even in this compact bath. 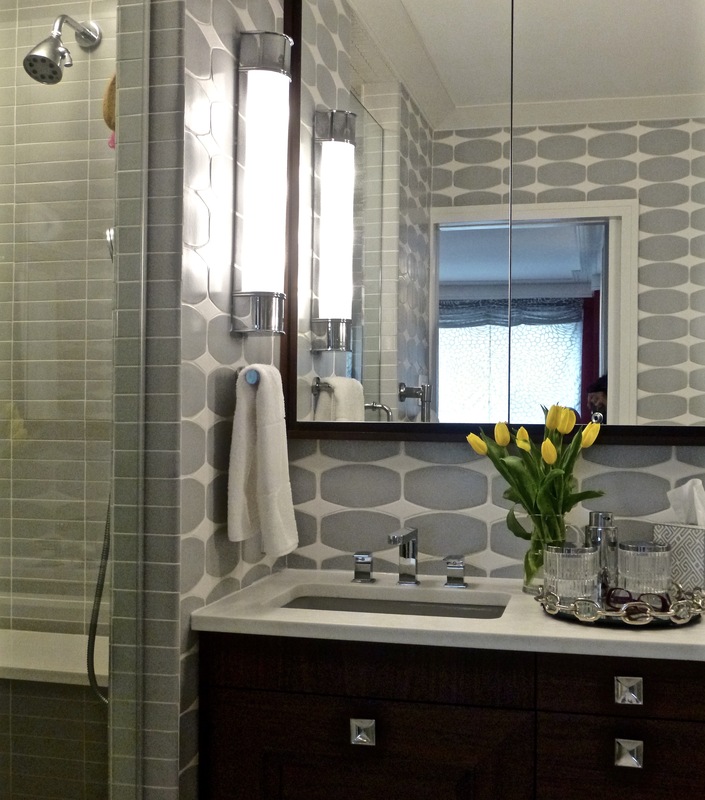 A custom designed floating wood vanity and framed medicine cabinets above say modern elegance. 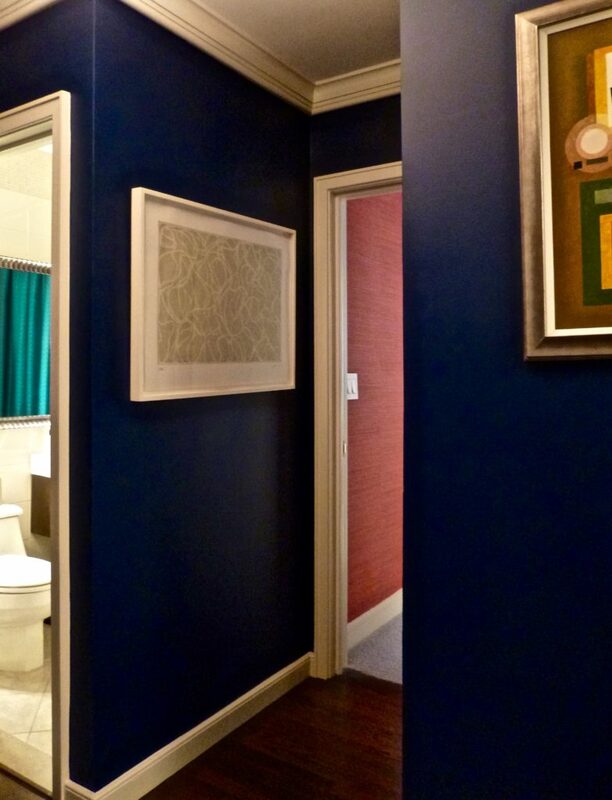 The deep blue painted walls in the bedroom corridors create a little drama in an otherwise ordinary narrow hallway. 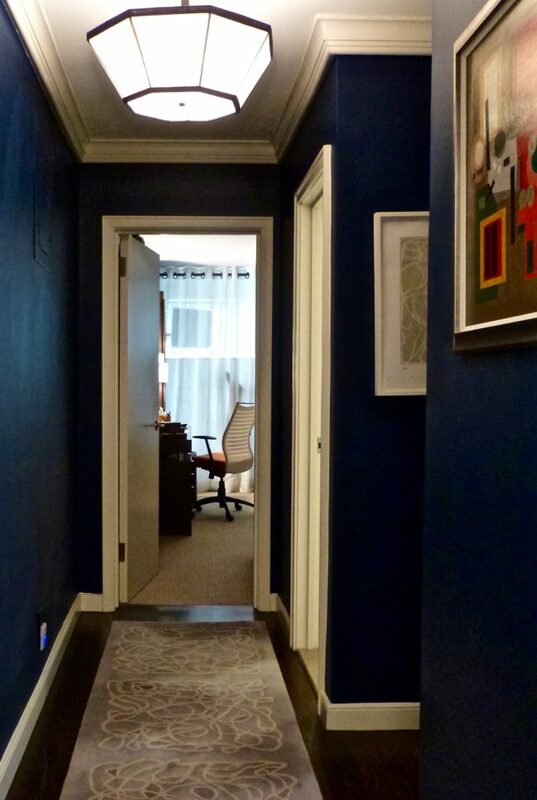 A custom designed runner and ceiling light fixture trimmed in navy linen help make the hallway to the office special. 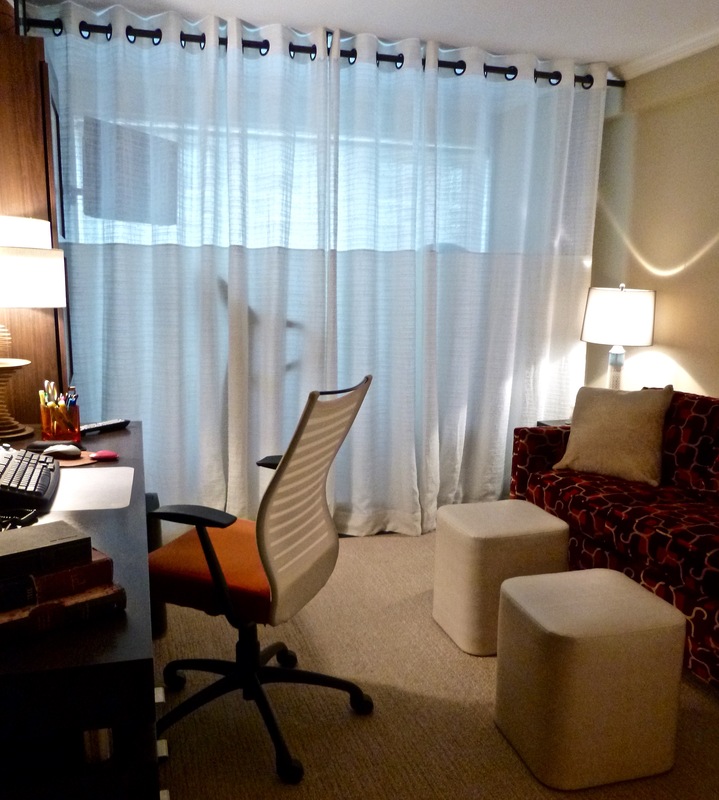 The upper sheer section of a floor to ceiling drapery gives a view through to the window while the lining of the lower section hides the exercise equipment in a nook at the window in the office.